As the fireworks were popping in the House of Representatives chamber, the South Wing of the Iowa Statehouse was seeing some political pyrotechnics of its own. The pugilistics began during debate of Senate File 1, which creates a second opportunity for Iowa-based companies that come within a statutory threshold of a competitive bid to rebid the project. State Sen. Liz Mathis (D-Robins) offered an amendment, which was approved on a voice vote, that made minor revisions to the overall bill prior to debate. During the nearly 30-minute debate over the bill, Republicans argued SF 1 would result in reciprocity legislation in neighboring states that could do more harm than good to Iowa businesses. Democrats, on the other hand, argued the bill would benefit Iowa businesses by ensuring they won state contracts more often, and that their tax monies would leave the state less often. The debate took a slightly personal turn during a colloquy between Mathis and state Sen. Mark Chelgren (R-Ottumwa) as the two debated those points. Click here to see video of the SF 1 debate. Shock and awe later ensued when Senate File 167, a bill to amend the process by which county compensation boards are construed, came up for debate. After an amendment offered by state Sen. David Johnson (R-Ocheyedan) that changed the wording of the bill to eliminate compensation boards altogether passed on a 27-24 vote, Senate Majority Leader Mike Gronstal quickly removed the bill from consideration. Click here to see video of the debate over the amendment. Things in the Senate really got crazy during debate over Senate File 227, which allows local school districts to set their own school start date. State Sen. Jason Schultz (R-Schleswig) first offered an amendment that effectively rewrote the entire bill, which was deemed not germane to the original bill. Johnson then offered another amendment that would add a requirement that school districts publish notices of public hearing whenever their school boards planned to take votes on school start dates. The amendment, following a lengthy debate on its merits, failed on a 25-25 tie vote. Chelgren then offered a third amendment authored by himself, Schultz, and state Sens. Amy Sinclair (R-Allerton), Ken Rozenboom (R-Oskaloosa), Jack Whitver (R-Ankeny), Tim Kraayenbrink (R-Fort Dodge), Mark Costello (R-Imogene), Jake Chapman (R-Adel), Bill Anderson (R-Pierson), and Randy Feenstra (R-Hull). After nearly 15 minutes of debate over the amendment, which would require school districts to give excused absences for students who wish to attend the Iowa State Fair, it was deemed not germane to the original bill. Tempers began flaring and unusual alliances began to form as urban Democrats and rural Republicans banded together to defeat the bill, while rural Democrats and urban Republicans fought together for its passage. SF 227 eventually passed on a 32-17 vote. Click here to see video of the bill’s debate. Senate File 178 – restricts convicted felons from receiving insurance proceeds and other benefits from the victims of the crimes they committed, passed 50-0. Senate File 198 – amends Iowa Code as it relates to the regulation of certified public accountants and CPA firms, passed 50-0. Senate File 203 – amends Iowa Code as it relates to people and activities regulated by the Iowa Board of Nursing, passed 50-0. Senate File 217 – amends Iowa Code as it relates to the Iowa Finance Authority’s duties regarding the Title Guaranty Board and Shelter Assistance Fund, passed 49-0 (state Sen. Amanda Ragan [D-Mason City] voted “present”). Senate File 218 – amends Iowa Code as it relates to operating snowmobiles in public rights-of-way on Interstate highways and freeways, passed 50-0. Senate File 300 – provides that people involved in intimate non-marital relationships will be treated equally to those who are married or in established domestic relationships as it relates to the crime of domestic abuse assault, passed 50-0. Senate File 309 – amends Iowa Code as it relates to the compilation of a presentence investigation report in a criminal proceeding, passed 50-0. Senate File 335 – provides that certain information shall be given to donor organ procurement organizations upon request, passed 50-0. Senate File 336 – amends Iowa Code as it relates to civil protective orders in sexual abuse cases, passed 50-0. 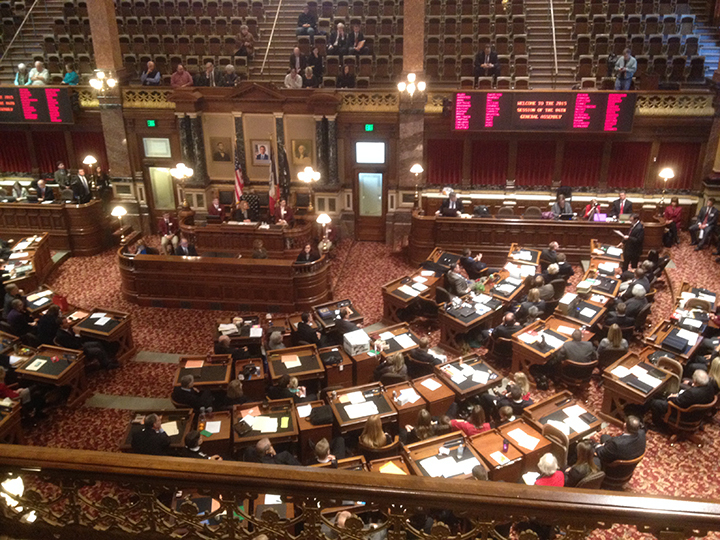 Senate File 220 – amends Iowa Code as it relates to expert witness fees, passed 48-2. Senate File 135 – amends Iowa Code as it relates to campaign finance filing requirements by requiring electronic submission of certain statements and reports and raising the minimum dollar amounts that trigger certain regulations, passed 45-5. House File 131 – a substitute bill for Senate File 197, establishes the definition of beer for purposes of beer brewers and wholesalers, passed 50-0. The Senate also debated Senate File 381, which provides the Iowa Department of Natural Resources with new, broad authority to make new rules regarding wildlife management as it relates to the control of animal disease. The bill passed on a 44-6 vote. Senators also took up Senate File 165, which provides that a county seat can be moved or relocated only upon passage of a referendum vote. The bill passed on a strictly part-line vote, 26-24. Click here to see video of the entire afternoon session.